Zeno of Citium (c. 334 - 262 B.C.) was a Greek philosopher of the Hellenistic period, active in Athens from about 300 B.C. He is considered the founder of the Stoicism school of philosophy (which became the dominant philosophy of the Hellenistic and Roman periods, and an influence on early Christianity). However, Zeno's philosophy was more of a middle way between the Cynics' complete rejection of society and the later Stoics' obsession with duty. He was the son of a merchant, possibly of Phoenician heritage (Citium had a large Phoenician population), and plied the trade of merchant himself until the age of 42, when he opened his Stoic school of philosophy in Athens. The school was named for the stoa ( or "porch") that Zeno used as his teaching platform. At one point, when he was around thirty years old, he became a student of Crates of Thebes (c. 365 - 285 B.C. ), the most famous Cynic philosopher living at that time in Athens. 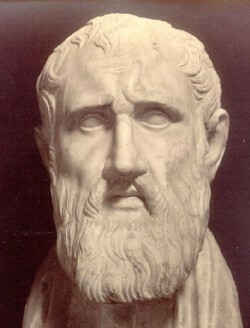 According to legend, Zeno was shipwrecked off the coast of Greece, and later wandered into a bookshop in Athens and was immediately attracted to the works of Socrates. On asking how to find the man, (Socrates was long dead by this time), the bookseller just pointed to the passing Crates of Thebes, and so Zeno became his student almost by default. Zeno was described as haggard and sunburned, and led a spare, ascetic life, which coincides with the influences of Cynic teaching (and which was continued in his own Stoic philosophy, at least in part). His main enjoyment was to sit in the sun eating figs and drinking wine. He inherited the Cynics' preference for gruff speech and shocking behavior, continually mocking the wealthy of Athens and consorting with a crowd of ignorant serfs and beggars (he was not above begging himself). The 3rd Century A.D. historian Diogenes La�rtius noted in his "Lives of Eminent Philosophers" that Zeno had very few female friends, preferring the company of men and boys (he did keep a female maid, apparently in order to avoid being labeled a misogynist). He lived, for a time at least, with Persaeus (306 - 243 B.C. ), who may have been Zeno's lover, servant or amanuensis, but was certainly his friend and favorite student. When Zeno was invited to act as an advisor to Antigonus II Gonatas of Macedonia, he sent Persaeus in his stead, and he would go on to became an important figure at the Macedonian court. Zeno died around 262 or 261 B.C. Diogenes La�rtius tells the rather strange tale that he tripped and fell leaving the school one day, and broke a toe. But, since a Stoic sage was expected to always do what was appropriate for Nature and, as Zeno was very old at the time (he would have been around 72), he felt it appropriate to die and consequently strangled himself. A tomb was built in honor of his moral influence on the youth of his era. Zeno's pupil Cleanthes of Assos (c. 330 - 230 B.C.) succeeded him as head of the Stoic school. None of Zeno's own works have survived to modern times, and all we know of him is from quotations and anecdotes in the works of his followers and critics. Because his ideas were built upon by other Stoics, notably Chrysippus of Soli (c. 280 - 207 B.C.) and Epictetus, it is difficult to determine precisely what his own thoughts and teachings were. Like the Cynics, Zeno recognized a single, sole and simple good, which is the only goal to strive for and which can only consist of Virtue. However, he deviated from the Cynics in his view that things which are morally indifferent could nevertheless have value to us. Zeno preached that "man conquers the world by conquering himself". He lectured his students on the value of "apatheia" (or the absence of passion), arguing that only by controlling one's emotions and physical desires could one develop wisdom and the ability to apply it. He held that the practicing Stoic could suppress the influence of the passions by developing an indifference to both pain and pleasure by means of meditation. He also invented the concept of "kathekon" (which has been variously translated as "befitting actions" or "appropriate actions for nature" or "proper function") which carries the sense that Man (and all living beings) must act in accordance with Nature. The Stoic's goal should be "katorthomata" (a perfect achieved kathekon action, derived from the "orthos logos" or reason). Zeno's philosophy offered a middle way between the Cynics' complete rejection of society and the later Stoics' obsession with duty. The famous Stoic acceptance of Fate, in Zeno's formulation, is nothing more than that: what happens, happens, and there is no point in complaining about it. Despite the influence of Stoicism on later Christian doctrines, Zeno's worldview was probably closer to that of Taoism, Hindu Vedanta or some varieties of Sufism than to orthodox Christianity or Islam. Of the many works Zeno was reported to have written, his "Republic" (written under Crates' tutelage) is the most famous and, although it has not survived, more is known about it than any of his other works. It was written in conscious imitation of (or opposition to) Plato's work of the same name, and it outlined Zeno's vision of the ideal Stoic society built on egalitarian principles, where virtuous men and women would live a life of simple asceticism. Among the doctrines Zeno advocated in the work (some of which were considered rather shocking and verging on Anarchism) were: the denouncement of general education; the belief that only the virtuous can be regarded as true citizens; the view that men and women should be considered equals and even wear the same clothes; the idea that women should be held "in common" (basically the promotion of "free love"); the acceptability of sexual practices such as masturbation, homosexuality and prostitution (although, strangely, not adultery), and the discouragement of excessive modesty; the exhortation that the wise man should produce children; the belief that temples to the gods, law-courts and even money were unnecessary for rational beings; and his call for a city built on the principle of love. In Metaphysics, Zeno believed that the whole Universe is God, a divine reasoning entity, where all the parts belong to the whole. Into this pantheistic system, he incorporated the beliefs of Heraclitus in a divine and creative fire, which extends throughout the Universe and foresees and produces everything. This divine fire or aether was for Zeno the basis for all activity in the Universe, operating on otherwise passive matter which neither increases nor diminishes itself, and the Universe underwent regular cycles of formation and destruction. The primary fire passes through the stage of air, and then becomes water, the thicker portion becoming earth, and the thinner portion becoming air again, and then rarifying back into fire.